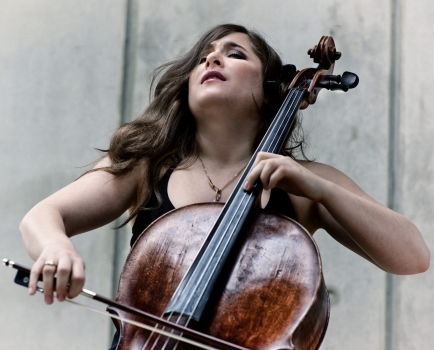 I first heard the American cellist Alisa Weilerstein five years ago, when I reviewed a recording in which she paired the cello concertos by Edward Elgar and Elliott Carter, a perhaps unexpected combination that succeeded due to the committed performance of Weilerstein. This imaginative approach of hers to programming is again evident in her latest disc, where she couples Haydn's two cello concertos with an ostensibly unlikely partner: Arnold Schoenberg's tone poem for strings, Verklärte Nacht. Accompanying her are the Trondheim Soloists, a Norwegian ensemble of whom Weilerstein was appointed artistic partner in 2017. The first thing that struck me right from the opening orchestral tutti is what an intriguing, captivating sound they make: delicate one moment and then pleasingly robust the next. There's an incisiveness to the way they spring their rhythms that is most satisfying. Even the plainest of accompanying bass lines are appealingly phrased and sculpted. There's an earthiness, a grit even, to the double basses, for example, that allows for a strikingly anchored foundation to the whole orchestral sound, and a gutsiness that is echoed by Weilerstein herself as she digs in most enjoyably to the many semiquavers and triplets of the first movement of the Haydn D major concerto. She particularly impresses in some of the extremely wide-ranging leaps, where her intonation in the very highest notes is absolutely spot-on. No less remarkable is the fearless way that she dispatches the double-stopped octaves in the last movement; all perfectly in tune and beautifully balanced with not a hint of effort or strain. These qualities are carried through into the C major concerto also, where Weilerstein demonstrates immaculate runs combined with ever-thoughtful articulation and dynamics. The last movement is certainly on the swift side, but crucially it never feels rushed or out of control, and again Weilerstein dashes off the lightning-fast scales with vim and relish. Inspired by a poem of the same name by Richard Dehmel, Schoenberg originally wrote Verklärte Nacht for string sextet in 1899, subsequently arranging it for string orchestra in 1917 (with revisions in 1943), and it is this 1943 version that is performed here. The masterstroke on the part of Weilerstein (who directs the ensemble from the principal cello chair) is that by keeping the orchestra relatively small and Haydn-sized, you get the best of both worlds: the depth of sound of the orchestral version (aided immensely by Schoenberg's addition of double basses) coupled with the intimacy that you normally only get with the string sextet version. I've heard more than one previous recording where some of the more awkwardly florid passages are nowhere near together, but here, just as it was in the Haydn concertos, everything is performed with one mind, exquisitely precise in terms of ensemble but with an expressive freedom that actually made me think at times that I was listening to the chamber music version! The range of sounds on offer is quite extraordinary too, from hushed passages that are genuinely chilling to rich chords that are full of warmth and radiance. There's a moment just over halfway through that best exemplifies this, where after an icy, barely audible E flat minor chord, the music suddenly shifts to a D major chord that comes out of the silence like a burst of sunshine, with the cellos playing a melody that is expressive and luminous without being overegged. This itself leads into a brief but ghoulish passage where the orchestra plays not only muted but also sul ponticello (near the bridge of the instrument), and it really shows off the breadth of colour and tone that this group achieves. This carries right through to the final chord: a perfectly-balanced, serene and immensely rewarding conclusion to a magnificent disc from Weilerstein and the Trondheim Soloists.